Over the past 18-24 months, an unknown number of online extremists have conducted “hacktivist” cyber operations – primarily Web site defacements, denial-of-service attacks, and release of personally identifiable information (PII) in an effort to spread pro-Islamic State of Iraq and the Levant (ISIL) propaganda and to incite violence against the United States and the West. Recent open source reporting from the Daily Mail India, indicates ISIL is recruiting Indian hackers and offering upwards of $10,000 USD per job to hack government Web sites, steal data, and to build social media databases for recruiting purposes. Indian officials believe as many as 30,000 hackers in India may have been contacted. The FBI cannot confirm the validity of the media reports, and beyond this single article on Indian hackers and ISIL, does not have information indicating any such relationship exists to date. 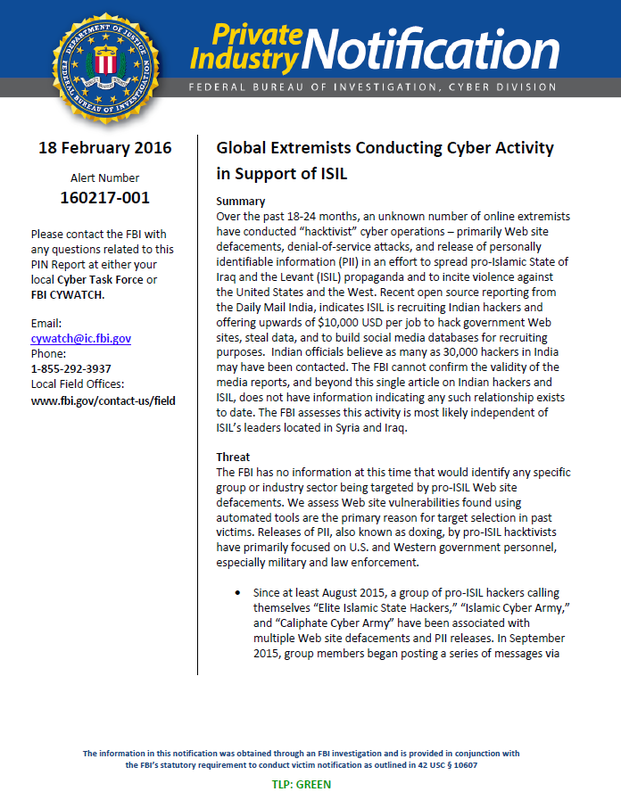 The FBI assesses this activity is most likely independent of ISIL’s leaders located in Syria and Iraq. Threat The FBI has no information at this time that would identify any specific group or industry sector being targeted by pro-ISIL Web site defacements. We assess Web site vulnerabilities found using automated tools are the primary reason for target selection in past victims. Releases of PII, also known as doxing, by pro-ISIL hacktivists have primarily focused on U.S. and Western government personnel, especially military and law enforcement. Since at least August 2015, a group of pro-ISIL hackers calling themselves “Elite Islamic State Hackers,” “Islamic Cyber Army,” and “Caliphate Cyber Army” have been associated with multiple Web site defacements and PII releases. In September 2015, group members began posting a series of messages via Twitter stating that they were conducting cyber attacks against the United States in commemoration of the September 11th terrorist attacks using the hash tag #AmericaUnderHacks for their Twitter postings. The postings included screenshots displaying access to several victim Web sites, as well as the posting of PII on President Barack Obama, the First Lady Michelle Obama, Congressional Staff members, government employees, and U.S. military members. Since the #AmericaUnderHacks hacking campaign in September 2015, group members have executed similar campaigns against the United Kingdom (#BritainUnderHacks), Saudi Arabia (#SaudiUnderHacks), Russia (#RussiaUnderHacks), and Israel (#IsraelUnderHacks). Open source reporting in India has noted the existence of several “hacking groups” within India. Thus far, such reporting has identified group names like “Indian Cyber Army” or “Shakti Campaign” and referenced such groups as having worked on behalf of the Indian government against Pakistan. To date, we have yet to see any validated reporting as to the capabilities of such groups or been able to confirm their existence. It does stand to reason; however, criminal hacking activity, whether by individuals or from organized groups exists in India and could potentially target US companies both for financial gain and for general acclaim. The FBI assesses most pro-ISIL hacktivist groups use relatively unsophisticated methods and tools to scan for and exploit well-known Web site vulnerabilities. Structured Query Language (SQL) injection, Cross Site Scripting (XSS), and social engineering tactics to obtain account credentials are assessed to be in the capability range of pro-ISIL cyber actors. The recruited Indian hackers are reportedly communicating on Internet based services like Skype, Silent Circle, Telegram, and WhatsApp. Pro-ISIL hackers use social media platforms like Twitter to make public announcements and release PII. Larger PII releases have been uploaded to online text sharing sites such as Pastebin.com and Justpaste.it. Enable automated patches for common vulnerabilities, and routinely update hardware and software applications, including anti-virus software. Only download software from sites you know and trust. Disable macros. Be careful of pop-ups from attachments that require you to enable them. Avoid using the same login and password for multiple platforms, servers, or networks. Use two-factor authentication for employee logins, especially remote logins. Create a centralized Information Technology email account for employees to report suspicious emails. Provide regular training to remind and inform employees about current social engineering threats. Monitor unusual traffic, especially over non-standard ports; and close unused ports. Utilize a Virtual Private Network (VPN) for remote login capability.